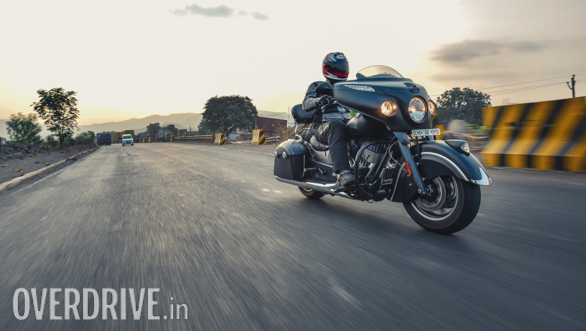 Well, this is an easy road test to write because the Indian Chief line contains my favourite cruisers, and the Chieftain has always been a spectacularly good machine. 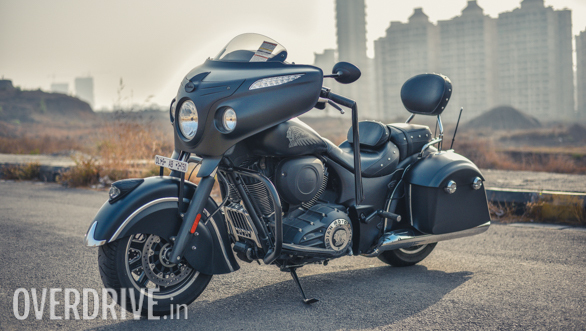 And now comes the seventh variant of the Indian Chief line, the Indian Chieftain Dark Horse, to give the gigantic motorcycle its equally long name. In essence, this is an expensive machine with every bell and whistle you can imagine. But the difference from the stock Chieftain to the Dark Horse version is primarily the colour scheme. As you know the Chieftain itself isn't the same as the Chief in one small way. Because when Indian decided to mount the fairing on the forks, they risked making the handlebar effort too high and the motorcycle hard to steer. So they used an additional fork offset and a different handlebar to create a motorcycle that felt similar or lighter than the basic Chief. In the process, the Chieftain also happens to feel better in corners. The heart of the matter, of course, is the brilliant Indian Thunder Stroke 111 engine. On the Chieftain Dark Horse, it makes 140Nm and it feels terrific. 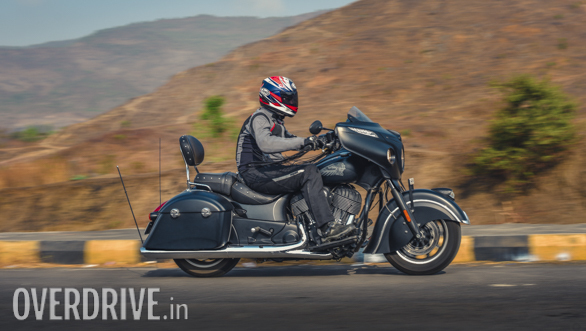 The flow of torque feels endless and exuberant, and you often get the sense that the 21-litre fuel tank has a built-in butter dispenser that's responsible for the silky power delivery and feel of the Indian Chiefs. And then there's the voice. It's a low, smooth, gravelly roar that builds with speed. But like an extremely powerful person, it never raises its voice, never does the octave change. It's a very, very impressive sounding motorcycle. The gearbox is clunky as all cruisers tend to be. But such is the flow of torque that there are three or more gears you can choose for any speed, and the highest of those gears feels the best to be in. But if you're in the mood, here is a near-400kg machine that will hit the 100kmph mark in 6.3 seconds! Fuel economy isn't low either. 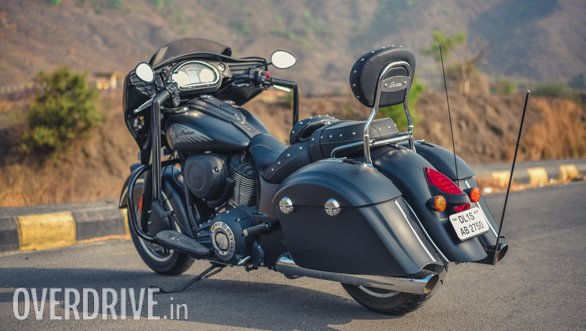 The Indian Chieftain Dark Horse returned a respectable 14.1kmpl in the city. And out on the highway, this rose to 19.9kmpl which is excellent. But you'd be a fool to think that the engine was the only impressive attribute. Because the Chiefs, Chieftain Dark Horse included, set the bar for the ride quality as cruisers go. The quality and size of the bumps that the Chief will swallow beggar belief. It takes a ride or two to understand how to handle this behemoth at low speeds through the undulating surfaces on bad roads, but the fact that it will absorb enormous potholes is undoubted. What you have to watch for is sharp reactions to undulations, and the fact that the extended front end means that after the handlebar has been turned a certain amount, the self-centring tendency is weaker than you expect. It's something you learn quickly and never think about again. What will make you stop and think is the handling. Because it is excellent. Unlike some sporty machines, though, the Indian doesn't hide its size. You always know how large the machine you're on really is. But it defies your expectations by proving to be a stable machine that reacts to inputs well, holds up its end of the bargain and is able to sit on either floorboard, grinding them away with happy, carefree cheer. Strong brakes complete a cohesive and impressive dynamics package. The look of the Chief is the last thing we'll talk about before we sign off. And it looks stunning in black. No eyeball in the vicinity is immune to it and if you like attention, the all-black might actually be a more powerful crowd-puller than the coloured Chiefs. The elegance with which the minimal chrome trim has been selected and planted makes me very happy. And I might vote for the CTDH - sorry the name's just too long to type over and over - as the best-looking machine of the line. The segment-busting finish and build quality levels - I am happy to report - haven't changed one bit. The same also goes for the huge list of standard equipment that includes cruise control and tyre pressure monitoring. 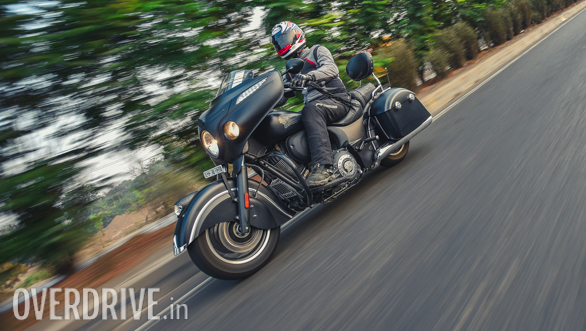 As you can tell, the Indian Chieftain Dark Horse is a very, very impressive machine, and that's not a surprise given how good the Chief line really is. It's an expensive machine to be sure, but it underlines what we learnt about the Indian Chief the first time we rode one. And that would be the fact that the Indian Chief is a very, very special machine. 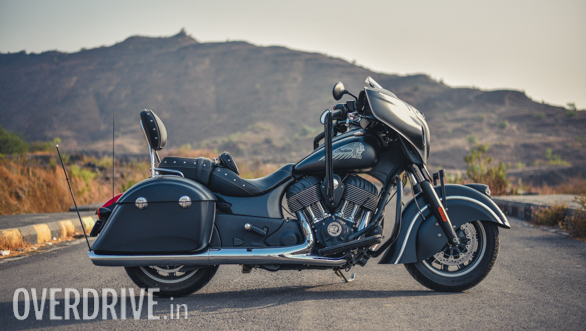 The Indian Chieftain Dark Horse is priced at Rs 32.5 lakh, ex-Delhi, which makes it Rs 3 lakh less than its closest sibling, the Indian Chieftain. 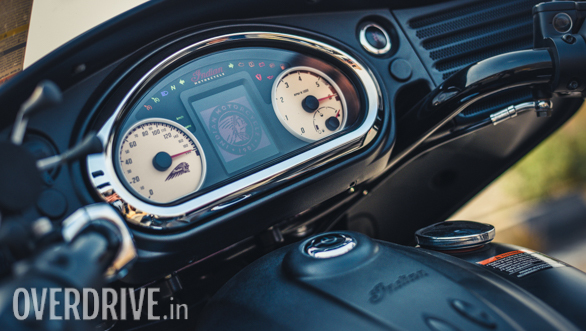 The motorcycle is on sale now at Indian Motorcycle India dealers.